Before we discuss what I ate yesterday, let’s take a quick look at the amount of candy that arrived home via my son’s trick or treat bag Monday night. Every Halloween I think he comes home with more Halloween candy than the year before but that’s probably because I forget just how much candy he can collect! This was a serious amount of candy this year, a serious amount. When I was a kid, I loved the peanut butter cups and 3 Musketeers. As I got a little older, I was ALL about the m&m’s. This year I randomly put myself on the hunt for Hershey’s Kisses (found none) and box of Dots. I don’t love the sugary/chewy candy but found myself in the mood for little box of Dots randomly but we got none! Every Hershey’s chocolate bar I could find in the pile (not the Hershey’s miniatures but not the giant bars, there’s a tiny size in between). Note: Mixing m&m’s with other types of chocolate really doesn’t taste good. I have always known this and should have remembered it when I chose to have the m&m’s after the Hershey’s bars. 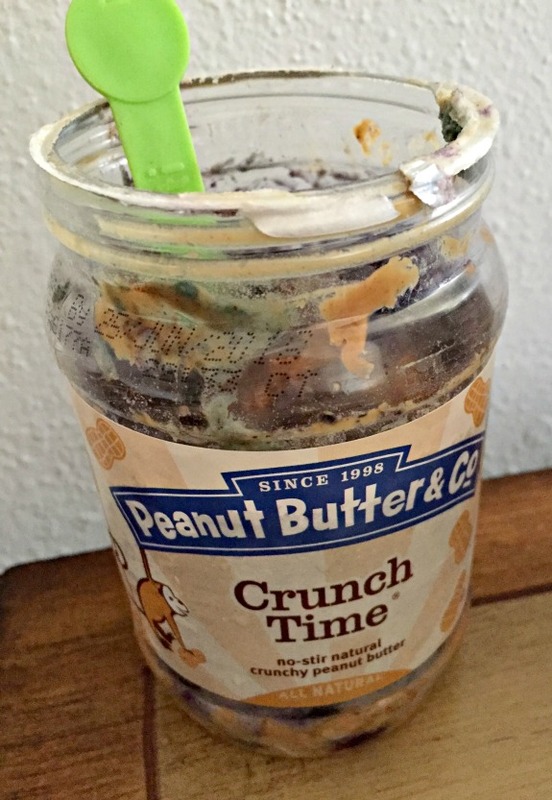 Moving on to what I ate yesterday…. Did you think I would eat something other than oatmeal? I had my usual pre-run oatmeal with banana and then had my post-run oatmeal and blueberries with Skoop B-Strong in an almost empty peanut butter jar. 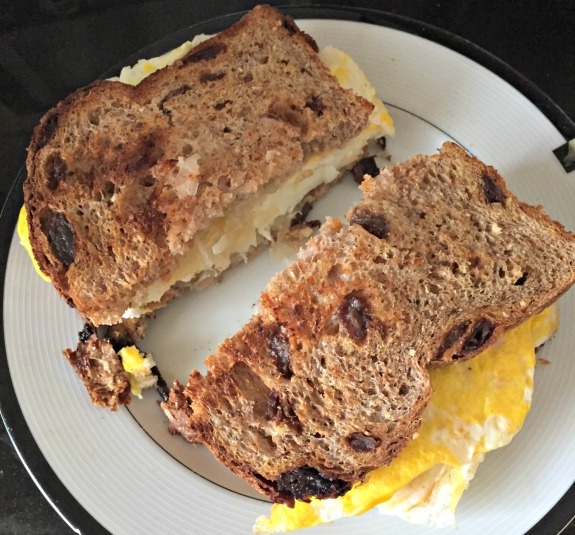 Just a simple egg sandwich with sauerkraut on toasted cinnamon raisin Ezekiel bread. I got the eggs and sauerkraut combination idea from Jen at Peanut Butter Runner. I really like it! By the way, I salt the eggs real good with sea salt while they are cooking which is an essential component to completing this sandwich for me. 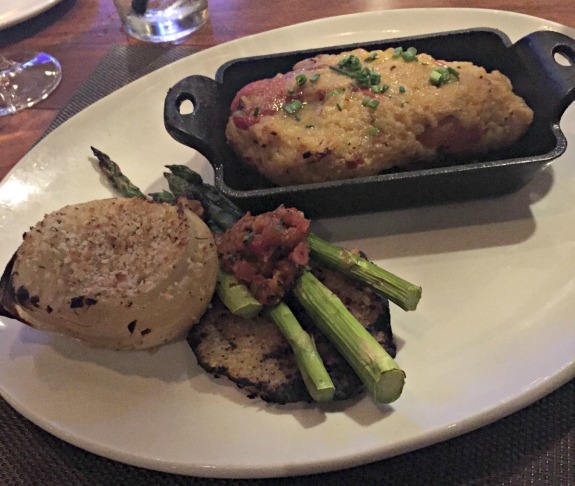 My son was going with his dad to the Islanders game so in between his fun, I went out for dinner at Season’s 52. I am not really sure what I ate but I ordered the vegetarian tasting and it was delicious. We also had a tuna tartare thing and brussels sprouts. 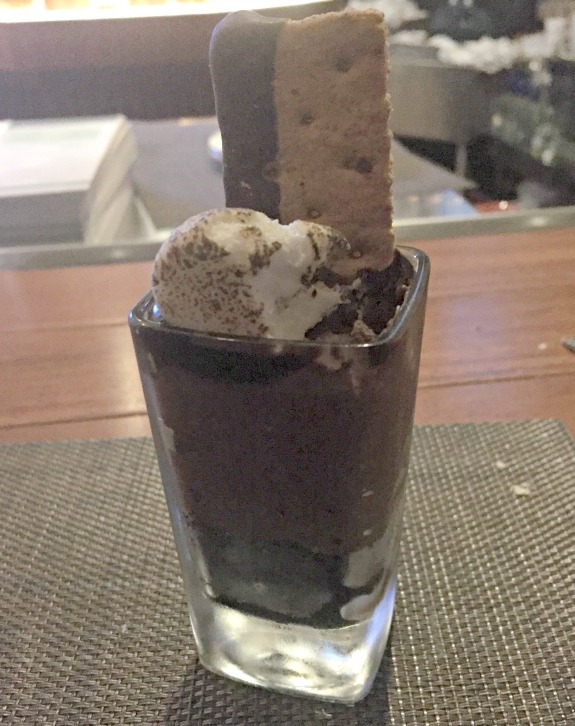 Season’s 52 is known for their small desserts. Of course I had the chocolate one. Actually, I had two of the chocolate ones, who could eat only one of these and call it dessert? Way too small! It’s What I Ate Wednesday – Be sure to check out what everyone else is eating today! What kind of candy did you eat on Halloween? What’s for lunch today? Did you plan it already to bring to work or will you wing it around lunch time? Do you like Season’s 52? my only issue with their desserts is that only one is chocolate! We have so much candy left over. I have been eating mostly the M & Ms. But I wish we had some reeses. There is alot of candy I don’t like leftover too- like starburst and nerds. By the end of the night we were trying to give handfuls of candy to the kids who were coming around but Im sure their parents were hating us! My cousin is a waitress at our local Season’s 52 so she always hooks me up, ha! Also, Reese’s every time. Always. Eggs with sauerkraut sounds so good! We skipped candy this year since we barely get any trick or treaters in our complex. But it’s Reese’s or M&Ms that I always choose! yeah the eggs and sauerkraut combo is really good! Holy Batman that is a lot of candy!! My favorite Halloween candy always changes from year to year. But I am usually always a fan of Milky Ways. And YES M&M’s DO NOT taste good with other chocolate, isn’t that so weird. I love combining M&M’s with candy corn and popcorn 🙂 And what kind of sauerkraut do you buy? I have been wanting to try incorporating some into my meals. Lately I get the big jar of organic sauerkraut from Whole Foods, the 365 brand. There’s nothing funky added and it’s really good as far as sauerkraut goes! Wow..that seriously is a ton of candy! What did he go as this year? chipotle day sounds like a great idea, we can’t always bring lunch, it’s nice to mix it up! my son is a little old for dressing up (although the girls do still at this age) but he did wear his islanders jersey and put on a fake mustache to look like one of the islanders. 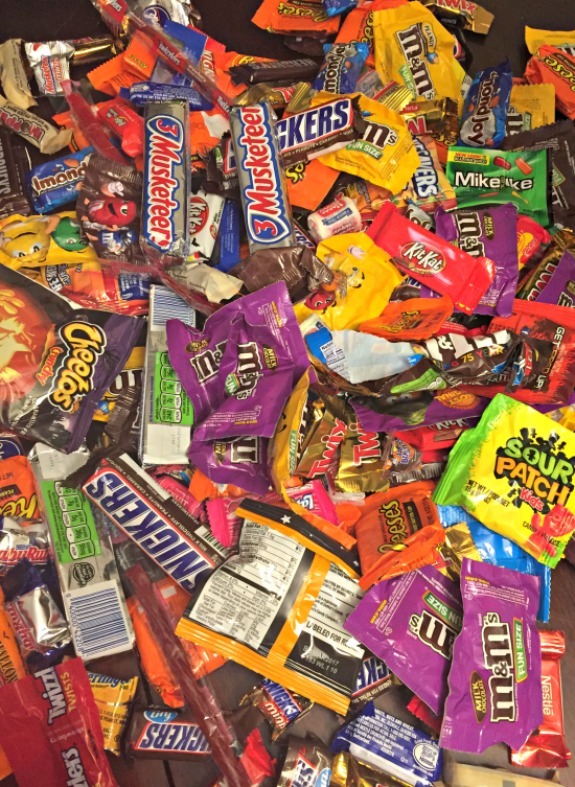 Your son is CHAMPION at collecting Halloween candy! I LOVE Reese’s. I think they will probably always be my favorite. I will always love them too! I love Season’s 52! I feel like it’s so versatile! Arthi recently posted…Monday Night Surprise. sometimes I like the sour patch kids, the red ones! Those small-but-not-mini Hershey bars have my heart and I cannot explain it. I’m so not a milk chocolate person 99% of the time, but I adore those specific ones! I go through such food phases and this made me realize it’s been ages since I’ve had eggs. Craziness. But they sound really good with sauerkraut, so I’ll have to give that a try soon! Now that’s a seriously impressive stash! I handed out candy this year and snacked on some between groups of kids. Mostly KitKats and Coffee Crisps, which have always been my favourite. I like anything wafer-y with chocolate and cream. Aaaand now I’m craving one. I went through a kit kat phase when I was younger. Halloween candy totally took over the house recently! I don’t eat it but make my own treats instead, I think we might have to donate it because I feel bad throwing it all away and there’s no way the kids will get through it. I know there are many places to donate the candy – I think you can send it off to the troops overseas too.